Ever since he was young, Matthew Karlowsky wanted to be a police officer, his father said. Then, when he was hired as a Washington patrolman eight years ago, he set his sights on one day becoming a police dog’s handler. His vision came to fruition Thursday night when the veteran officer and the city’s new police dog, Golem, were formally introduced during a swearing-in ceremony at City Hall. Golem, a 10-month-old German shepherd, could barely control his excitement for the ceremony, barking at times and searching for his ball in the cargo pocket of Karlowsky’s pants. The dog was born in the Czech Republic and trained with Karlowsky for six weeks at Shallow Creek Kennels in Mercer County. Karlowsky gives Golem commands in Czech as they continue to train to hone the dog’s drug-detection and patrol skills. Karlowsky served in the U.S. Army during the Iraq war and it was during that 14-month deployment that he wanted to work with dogs after watching military K9 handlers, his father, Rick, said. “This boy has always wanted to be a police officer, and ever since then, he wanted to be a K9 handler,” Rick Karlowsky said. The community raised about $47,000 the past nine months to restart the department’s K9 unit, including a $10,000 grant from the Ben Roethlisberger Foundation. Mayor Brenda Davis said the community support and local business donations were instrumental in bringing back the unit, and city officials hope to expand it to two dogs by the end of the year. K9 Cash is a 2-year old Belgian Malinois. 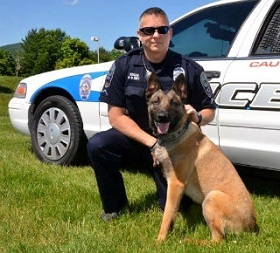 He is trained in drug detection and patrol work. Patrol entails suspect apprehension, tracking, and agression control. We work for the Roanoke County Police Department in Virginia. Cash and I have been on the road for almost a year now and we love it. Cash has quite the knack for finding drugs. Cash and I are both huge Steelers fans. I make it to at least one game a year (Cash stays home and watches on TV). Things aren’t looking good for me making a game this year but hopefully I can. Just wanted to say, that although I’ve always been a Steelers fan – I’m even more proud to be one and a fan of Ben’s because of his foundation and his love and support for Police K9’s across the country! *Thank you so much to Mayor Brenda Davis, Officer Karlowsky, and Officer Hogan! If you’d like to make a donation to Ben’s foundation, you can do so here!